Once again, Haikasoru has given us English-language readers some great Japanese science fiction for our brains to chew on. 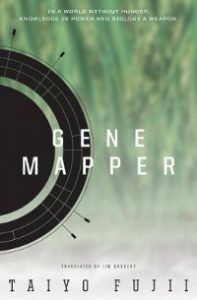 Taiyo Fujii’s Gene Mapper (translated by Jim Hubbert) brings together genetically-modified food, trippy virtual-reality technology, and a world recovering from the combined blows of an Internet collapse and a devastating famine. Have I piqued your interest yet? It’s the year 2036, nearly two decades after the Internet went haywire and a famine swept across Asia, killing millions. These two devastating events led to the rise of genetically-modified, tightly-controlled crops and a new world wide web called TrueNet, also highly controlled and administered. What do these two things have to do with one another? Both the crops and TrueNet are supposedly upgraded, “better” versions of their earlier counterparts, which still exist in certain places. Despite the rise and success of superior genetically-modified crops, the possibility exists that something could go wrong (and it does), just as the Internet survives in a fractured way as an alternative to TrueNet (and a place where one goes to salvage old/hidden data). When the crop logo that Mamoru Hayashida designed is attacked, this gene mapper must work fast to contain the damage before the world sees that one of the most successful engineered crops is still vulnerable to attack. The crop site, known as “Mother Mekong,” is supposed to represent the pinnacle of food technology, and it is Hayashida’s job to manipulate the colors of the crop to project logos and certification marks that can then be seen by a satellite imaging service. In this way, people around the world can always see that the crop (known as SR06) is well-controlled and orderly. They’d be assured that a devastating famine would never happen again. But nothing is that simple. When a group of anti-GMO activists release a strange grasshopper into the Mother Mekong site that degrades the logos and certification marks, the company that owns it (L&B) scrambles to contain the damage and restore the logos before the satellite comes around again and shows the world what happened. As the logo designer, Hayashida is tasked with finding out what went wrong and fixing the problem. He teams up with Takashi Kurokawa (himself a victim of GMO food gone wrong) and a hacker named Yagodo to investigate the Mother Mekong site. During the investigation, Hayashida is involved in multiple virtual-reality meetings, in which participants’ behavior, physical appearance, and even ability to disclose information is controlled by computer code. At times, it’s difficult for the reader, as well as Hayashida himself, to know where reality ends and virtual-reality begins. The investigation takes Hayashida and his team across Asia and into the field itself in search of the mysterious grasshopper intruder. Only when Hayashida realizes that there’s a saboteur in their midst does he understand the full scope of the attack on Mother Mekong. While Gene Mapper has great forward momentum and a clever story line, its characters are unsatisfyingly flat. I especially wanted to know more about the saboteurs and their motives, as well as Hayashida’s life before he became a gene mapper. Ultimately, though, this is a novel of ideas rather than people, and a thought-provoking one at that. I, for one, haven’t come across many other sci-fi thrillers about genetically-engineered crops and highly-advanced virtual reality technology. So believe me when I say that Gene Mapper is well worth the read.